I am very excited to be bringing the Masters of Hawaiian Music back to my hometown of Chatham, NJ. Hope you can join us for one of my favorite lineups yet. 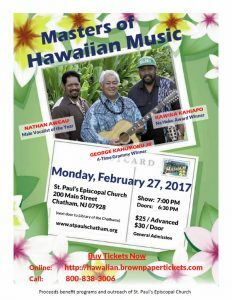 We are excited to welcome George Kahumoku, Jr., Nathan Aweau, and Kawika Kahiapo to Chatham for an evening of Grammy award-winning Hawaiian music. Buy your tickets early and please help spread the word. Email me or call 973-886-6836.